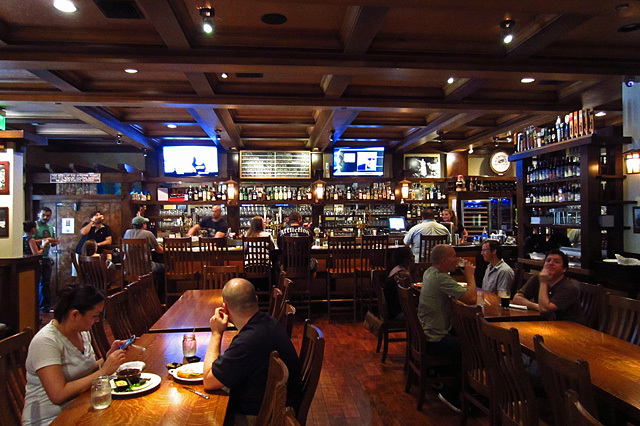 Located on a quiet stretch of San Fernando Boulevard in downtown Burbank, Story Tavern is much more than your average gastropub. Yes, there are 20-plus craft beers on tap, flatscreens above the back bar, and the menu includes traditional pub fare such as shepherd’s pie and bangers and mash. But the moment you step into the Craftsman-style tavern, it quickly becomes apparent that something special is happening here. Last month, Story Tavern launched a classic cocktail menu for the first time in its one-year history. On a recent Sunday afternoon, co-owner Brian Slaught – a fifth-generation Angeleno – hosted a tasting of the new drinks and shared the story behind the Story. I was joined at the tasting by Brian Carr, who recently moved to Burbank with his wife, Tricia. In addition to the historic photos, many of the artifacts on display are from the Slaught family vaults. Some are specifically related to Los Angeles, while others are objects that were collected during the 143 years the Slaughts have been in LA. 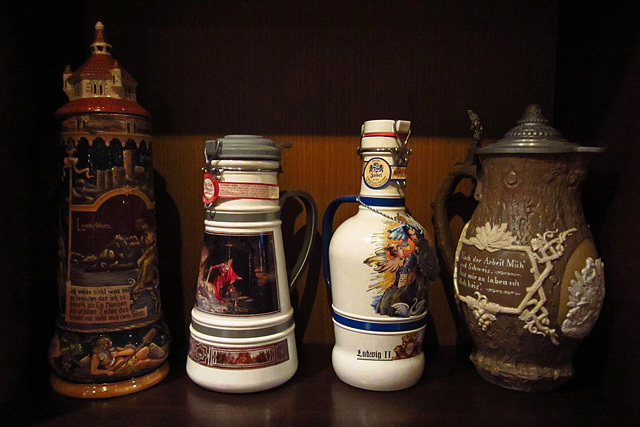 Slaught brought over a German beer stein from 1936 for us to examine. It was decorated in a Wagner theme, much to the delight of Carr, who said he’s a “huge fan” of the German composer. 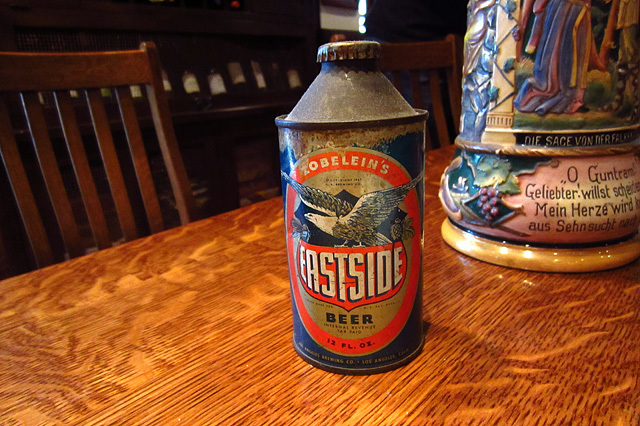 Slaught also presented an Eastside beer can from 1947. Known today as the Brewery Arts Complex, the Eastside Brewery was part of a forgotten period of LA beer history that predates today’s craft beer scene by decades. The Slaught family is primarily involved in commercial real estate and restaurant development, but they’d been toying with the Story Tavern concept for a while. Slaught said he had been a barback since he was 18 years old, and his sister Diane had been working in restaurants since she was 18. In a calculated nod to history, Story Tavern incorporated on July 8, 2011, the 100th anniversary of Burbank’s incorporation as a city. 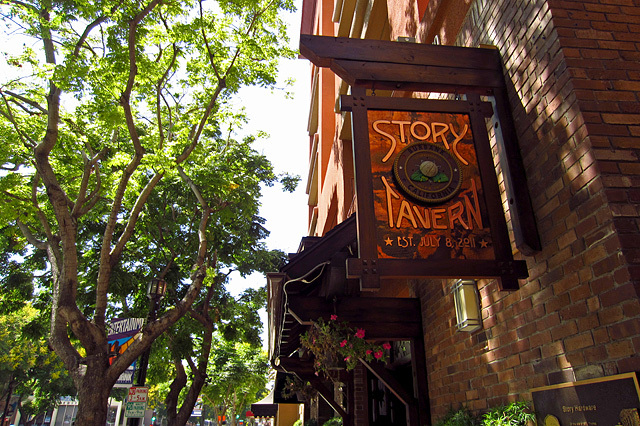 Story Tavern opened to the public on July 4, 2012. 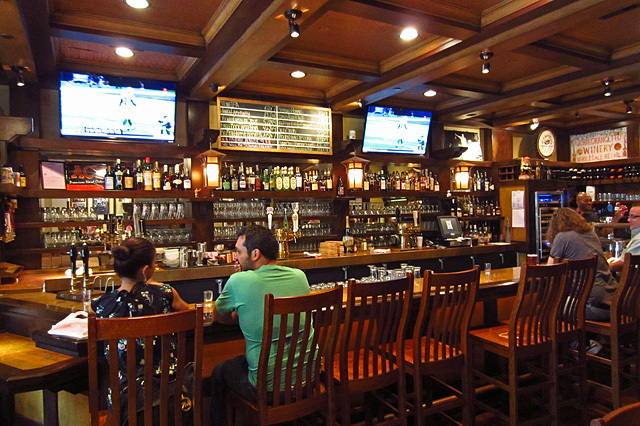 Regarding the tavern’s interior design, Slaught explained that he and his family are big fans of the Pasadena Craftsman-style bungalows. “To be true to a real pub, when you go to the south end of Dublin, all of the Georgian architecture there is mid- to late-18th century, and so are the pubs,” he said. “So what was the prevalent architectural style in Burbank, Glendale and Pasadena when Burbank became a city in 1911? And that was Craftsman.” The high level of workmanship extends to Story Tavern’s furniture – every piece is handmade by the Amish. After Story Tavern opened, it took a few months for the community to get a feel for the newcomer. 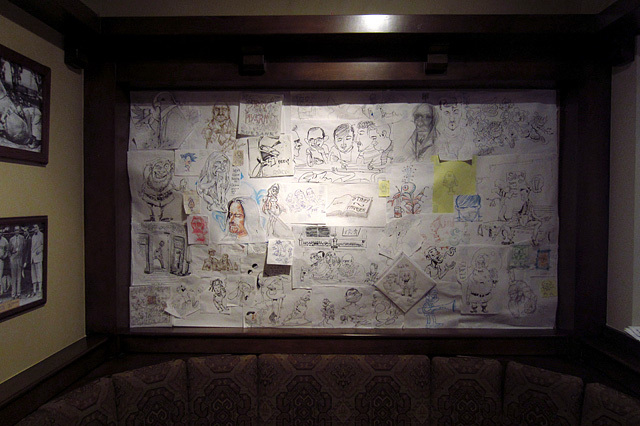 “But once they embraced us, the majority of our regulars – if they’re not working at Nickelodeon, DreamWorks, Cartoon Network, Disney – they live in Burbank.” Slaught pointed to the “Animators’ Booth” just inside the entrance, adorned with dozens of drawings created by Story Tavern regulars: “They’re here three or four times a week.” The mayor, city employees, and off-duty Burbank police are also frequent guests. Yvonne Slaught utilized years of experience cooking for her daughter to create recipes for Story Tavern’s menu, which features a gluten-free version of almost every item. 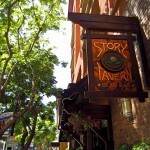 With nary a fryer on the premises and a veggie burger that’s truly vegan, Story Tavern is unique among gastropubs. If customers didn’t accept the menu, Slaught said they would have considered another approach. Not only was the gluten-free cuisine accepted, food sales have continued to grow. 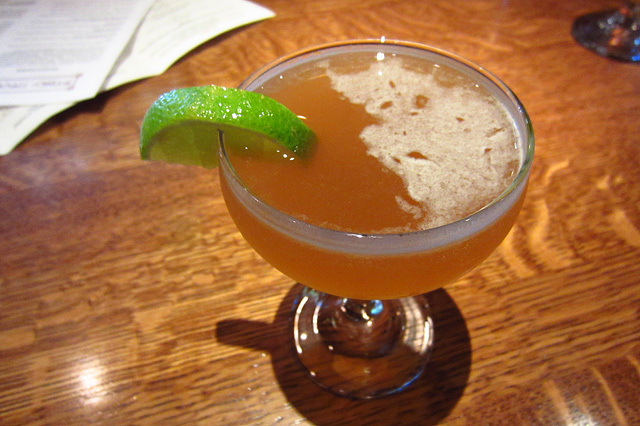 Brestel and Slaught – who also has a degree in History – approached the creation of the cocktail menu like a history project. “You have one main source you kind of use as your guidebook, and you have your ancillary resources,” said Slaught. For weeks they researched the online archives of the Central Library in downtown LA, as well as California records via UCLA. They found copies of old bar menus and established what drinks were served back in the day, but of course these online documents didn’t have recipes. As they continued their research, Slaught said they found conflicting recipes and tried recipes sourced from several books. And the book they kept returning to was Vintage Cocktails by Ted Haigh, quite simply because “it had the best recipes.” Slaught noted Haigh’s historical accuracy as another reason for its influence on the Story Tavern cocktail menu. Slaught said the debut menu was whittled down from a list of 300 cocktails, with a focus on drinks that were served in the Burbank/Los Angeles area circa 1900-1950. “I’ve always liked making really, really old fashioned cocktails, because they’re almost all alcohol,” he laughed. “It’s not so much the crazy process – a lot of our cocktails only have a few ingredients – but it’s the quality of the ingredients that really sets them apart.” It’s an approach that echoes the ongoing renaissance of cocktail culture. “I’m glad Los Angeles in particular is getting back to its roots as a mecca for cocktail innovation,” said Slaught. Slaught presented a trio of cocktails from the new menu, including two of his personal favorites – the East India Cocktail and the Jack Rose – as well as The Derby. 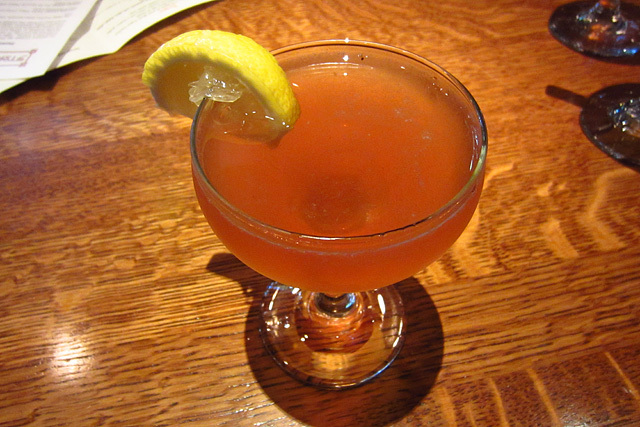 The standout was the Jack Rose, nicely balanced and as well-made as any I’ve had elsewhere. Both the East India and The Derby skewed to the sweeter side, but my preference for spirit-forward cocktails and lack of a sweet tooth had already stacked the deck against these two cocktails. The final drink of the tasting was the Fairbank Cocktail, a Martini variation made with gin, dry vermouth, Regan’s Orange Bitters and crème de noyaux. 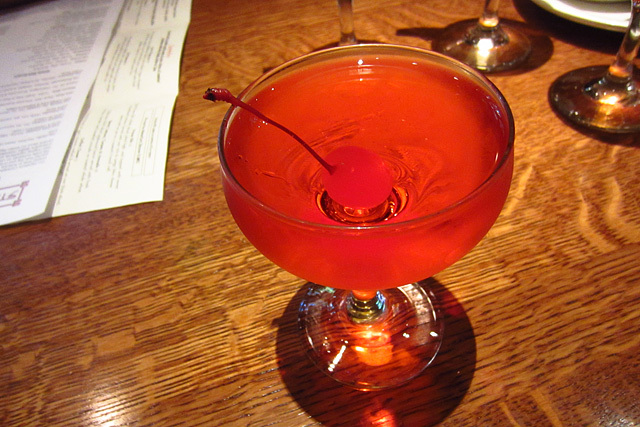 The Fairbank was dominated by the almond-flavored crème de noyaux, and instead of light pink – as shown in this Cold Glass post – its color was closer to the neon red of the maraschino cherry garnish. Slaught explained that the recipe was adjusted because guests had complained about the drink being too gin-heavy. With the amount of research and thoughtfulness that’s been invested in the drinks, Story Tavern is already on another level compared to its neighbors. And Slaught knows how to address the needs of his clientele better than anyone. But rather than deviating from tried-and-true recipes that Slaught has acknowledged as being the best, there’s an opportunity for Story Tavern to foster Burbank’s appreciation for classic and craft cocktails the same way that Glendale’s Neat and The Famous – and 1886 Bar in Pasadena – did for their respective communities. 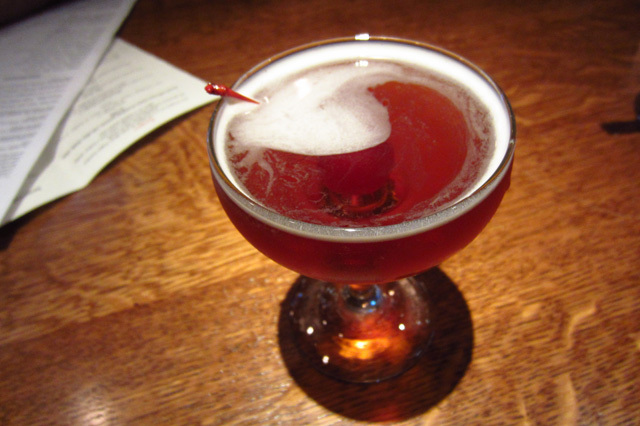 The Famous in particular has several parallels to Story Tavern, from its location in the landmark Huntley-Evans building to its display of historic Glendale photos and a classically-driven cocktail menu. Slaught is building on the initial success of the cocktails and spirits by adding punch bowls, as well as working on hosting single malt and bourbon tastings. Best of all, in mid-October Story Tavern will expand to the space next door, doubling its capacity to about 200 guests and adding a larger patio and traditional pub game room. The next chapter of Story Tavern is already being written, and the best bar in downtown Burbank is about to get even better.